Enterprises seeking the productivity benefits of a mobile workforce have been forced to do so with mainly consumer-oriented mobile services. The “First Wave” of mobility over the past 20 years was focused on consumers, with the features and service configurations that mattered most to individual, private users. •Moving control over services and policy enforcement into enterprise IT’s hands. •Integrating mobile communications with enterprise applications such as Customer Relationship Management, Workforce Optimization, Customer Experience Management and others. •Mobile Unified Communications, “Mobile Native” and “Mobile First” communications strategies. •Capturing, recording, logging and archiving mobile voice and text communications for compliance. •Managing multiple user identities and personas, for separating business and private communications. •Advanced applications such as sending and receiving text messages using business numbers. •Cloud-based mobility architectures, private wireless and mobility models such as Private LTE. The webinar will feature analysis and market trend data presented by Raúl Castañón-Martínez, Senior Analyst, Workforce Collaboration and Communications, of 451 Research. 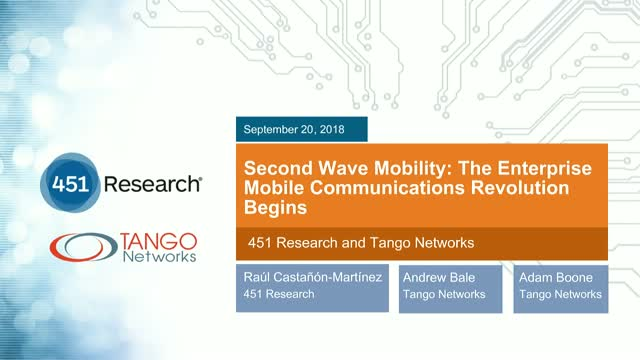 Andrew Bale, General Manager of Cloud Services for Tango Networks, will present case studies and use case examples of Second Wave Mobility, including unveiling Tango Networks’ new enterprise mobile communications service and messaging application.